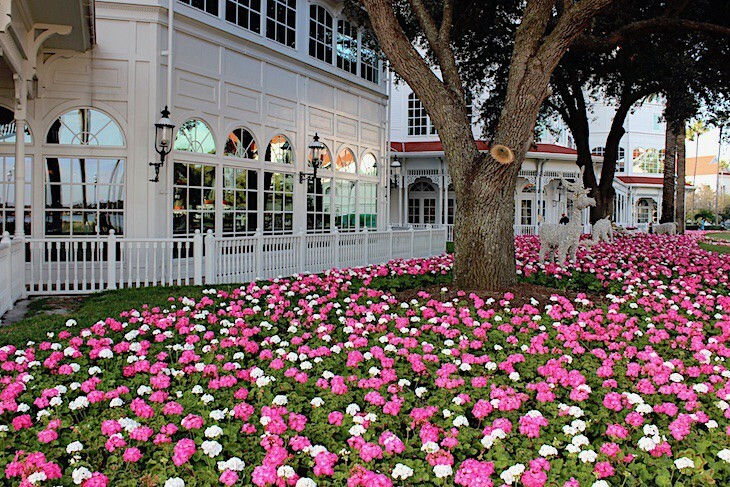 Spreading along the shore of the Seven Seas Lagoon with views of the Magic Kingdom® Park is Disney’s flagship, the Grand Floridian Resort & Spa. 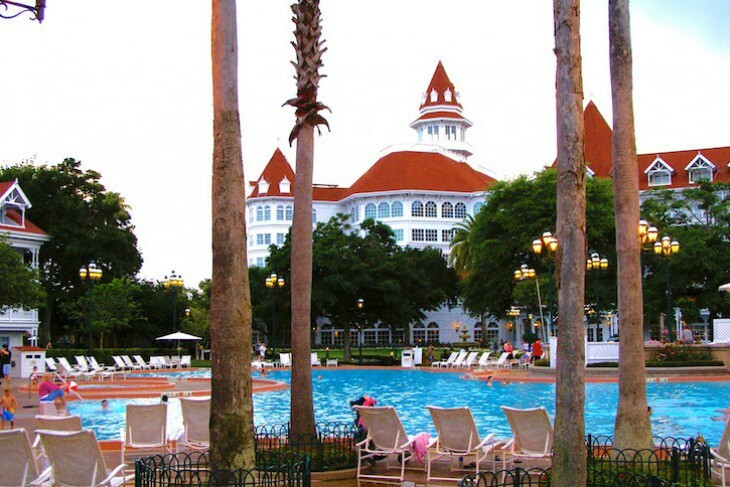 Its red-gabled roofs and Old-World Floridian elegance transport you to the time of Florida’s nineteenth-century grand seaside “palace hotels.” Impeccably maintained and manicured grounds are strung with fragrant, blossom-filled lanes that meander among the gracious four- and five-story buildings fabricated with gleaming white clapboard siding, red shingled roofs, fairy-tale turrets, and intricate latticework. Guests’ preferred gathering spot is the soaring five-story Grand Lobby topped with stained-glass cupolas and massive filigreed chandeliers. Strewn with potted palms, cushy seating, and extravagant flower arrangements, it’s at its liveliest in the late afternoon and evening hours when entertainment rotates between a relaxing piano player and a dynamic “big” band. Because the resort possesses a popular wedding chapel don’t be surprised to see white-gowned brides frequently roaming the lobby. If you’re in luck a Cinderella coach with footmen and white ponies will be on hand to whisk away the newly wedded couple. 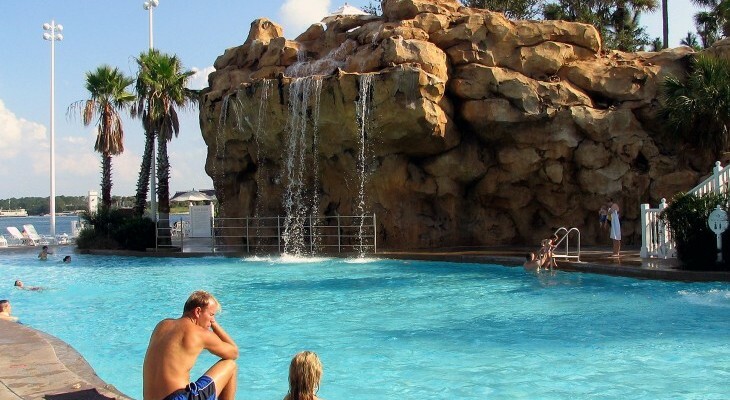 Aquatic enticements include a sugar-soft sand beach, a large pool in the central courtyard, a beachside Florida springs–style pool, and a marina sporting a wide assortment of watercraft including a 52-foot yacht. A full-service spa and health club, three lounges, and upscale shopping round out the list of exceptional offerings. The restaurants here are also quite a draw, notably Victoria & Albert’s, central Florida’s rightly famous, award-winning gem. And early rising guests on Monday and Friday can enjoy a parasol parade at 8 a.m. when over fifty members of the housekeeping staff, parasols in hand, stroll through the courtyard around the pool—a perfect start to the day! 867 rooms. 4401 Floridian Way, Lake Buena Vista 32830; phone (407) 824-3000, fax (407) 824-3186. Check-in 3 p.m.; Check-out 11 a.m. Here you'll find cabanas available for rent with LCD cable TV, DVD/CD/MP3 player, satellite radio, wireless internet, beverage stocked refrigerator, and fruit basket; a private massage is available for an additional fee. Each evening entertainment rotates between a relaxing piano player and a dynamic eight-piece big band. 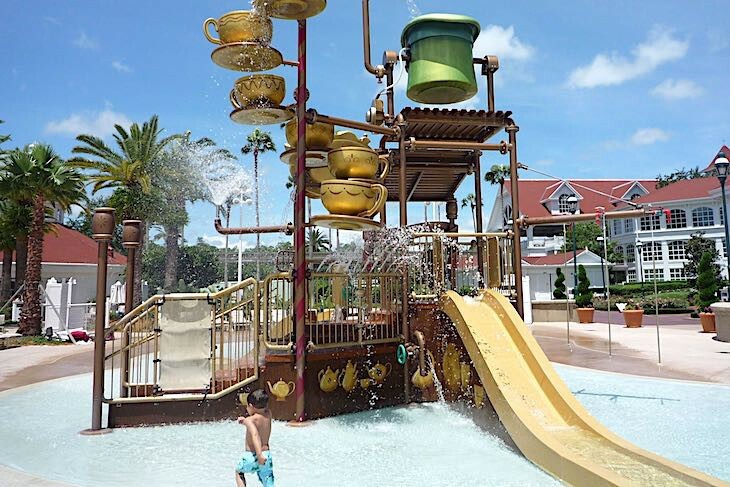 Kids love splashing to their heart's content here. 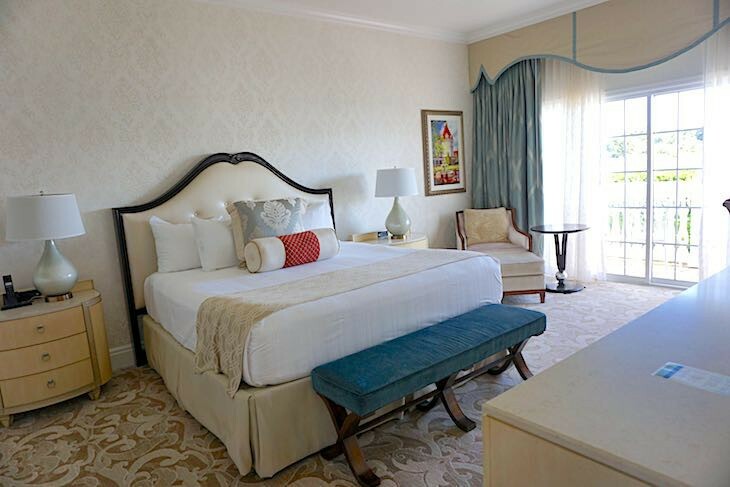 Grand Floridian guest rooms offer 440 square feet in Walt Disney World's flagship resort. 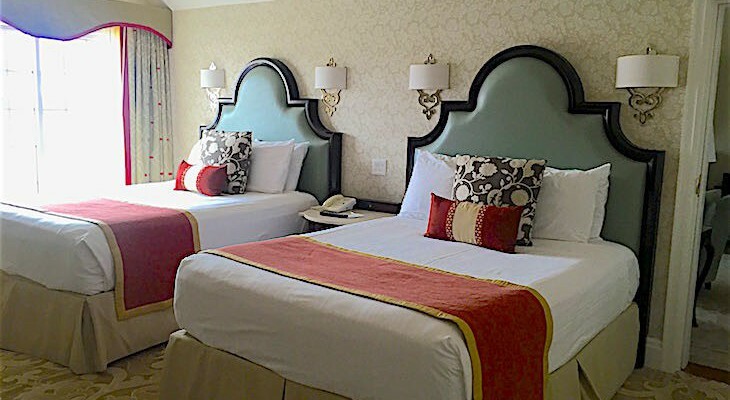 Each offers either one king or two queen beds—only a few have kings—and a full-size sofa in cherry red with powder blue throw pillows (those on the top dormer floors come with only an easy chair and ottoman). 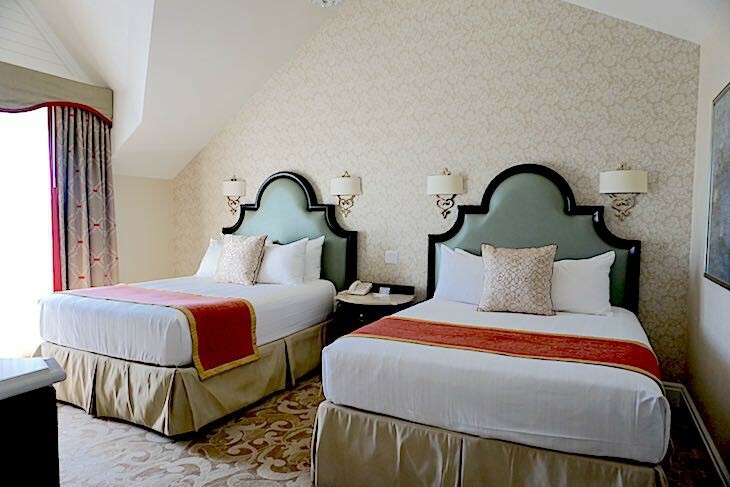 Beds are outfitted with cream leather headboards, white sheeting, and rose-colored bed runners. Soft blue and beige touches in the carpeting and silver accents on side tables and wall scones lend an air of shimmering sophistication Large flat-screen TVs, under-counter refrigerators are additional amenities along with white marble-topped writing desk and bureau. Cream-colored marble baths have twin sinks, H2O+ Sea Marine and Sea Salt bath products, full-length and make-up mirrors, and hair dryer. The closet contains an electronic safe, iron and ironing board, and robes. 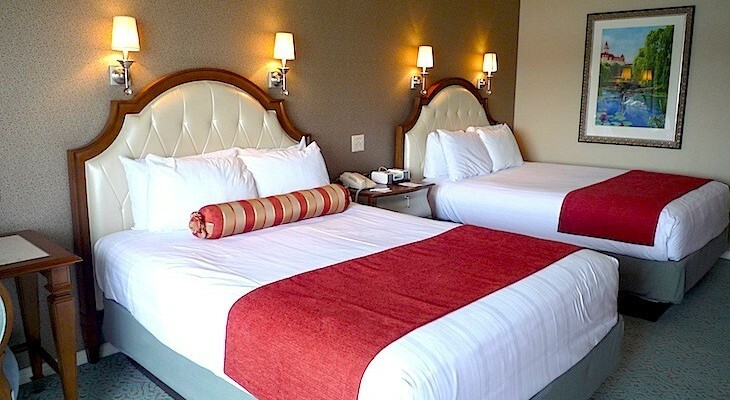 All rooms have daily newspaper delivery, Keurig coffeemaker, and nightly turndown service. Most accommodations come with generous balconies and vary only in view—Garden View, Lagoon View, or a Theme Park View. Outer Building Theme Park View rooms with vistas of the Magic Kingdom do not always mean a view of the Castle (request the Sago Key or Conch Key building for a Castle view since the Boca Chica building looks mostly at Space Mountain). Outer Building Lagoon View rooms are also a nice choice facing the Seven Seas lagoon, The Villas at the Grand Floridian Resort, and Disney’s Polynesian Resort. 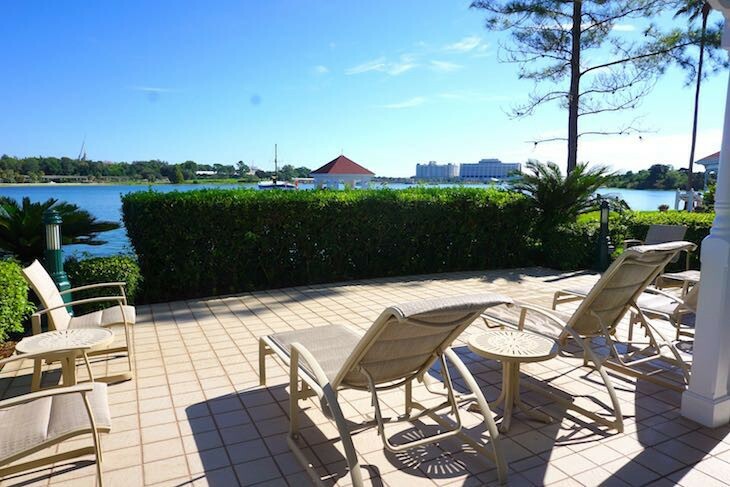 Garden View rooms overlook the flowering grounds, the sparkling courtyard pool, or the marina. Top-floor guest rooms have vaulted ceilings along with balconies that require standing for a view. Although their high ceilings give them a more open feel they are actually a bit smaller than a normal guest room and come with only a chair and ottoman in lieu of the standard daybed. Outer Building Deluxe Garden View rooms are located in the turreted corners of the buildings. Similar to a standard room with balcony, they offer the bonus of an additional sitting area and second TV for a total of 574 square feet. Cara's Tip: Rooms in the Sago Cay building have maximum peacefulness in a setting far from the pool. However, they also require a longer walk to the main building. The Sugar Loaf (concierge) and Big Pine buildings are closest to the main building and the monorail. Accommodations on the concierge level vary from standard guest rooms to larger Deluxe Rooms and suites. 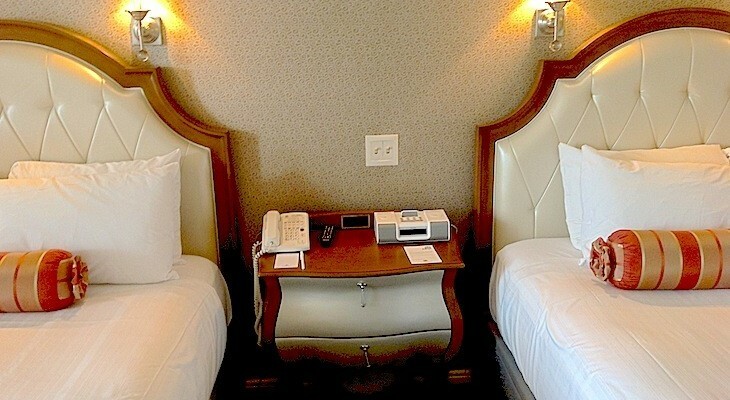 Beware requesting a Standard Concierge King Bed Room in the Main Building; two are corner rooms (Rooms 4329 and 4429) smaller than normal with only enough room for the bed, one chair, and an armoire. Concierge Theme Park View rooms in the Main Building all have a vista of the Castle. Deluxe Rooms at 634 square feet, all located in the Main Building, offer a spacious sitting area within the guest room with a sofa, coffee table, entertainment center, wet bar, writing desk, two chairs and a table, and two queen-size beds (but never a Magic Kingdom view), three on the 4th floor and three more on the 3rd floor (if you want a quieter location request the 3rd floor since 4th floor rooms are found just off the lounge). Deluxe King Rooms sleeping two are in the Main Building and are privy to the Royal Palm Club, but there are two variations: six turreted rooms with 648 square feet offering a 4-poster bed, bay window sitting area with sofa and easy chair, entertainment armoire, wet bar, small walk-in closet, and oversized tub, but no balcony and only a few offering a semi-view of the Castle; and 440 square feet standard-size guest rooms, all with a marina/Magic Kingdom view, balcony, and whirlpool tub located on the 2nd floor above Gasparilla Grill. Room type is on request only. The Royal Palm Club, located on the fourth floor of the main building in a prime position overlooking the Grand Lobby, is the more upscale of the two concierge lounges with views of the Seven Seas Lagoon and the resort’s lovely courtyard. Serving all rooms of the main building and all suites throughout the property regardless of location, you’ll find a concierge staff on duty near the main elevator of the third floor. The Sugar Loaf Club in the Sugar Loaf outer building offers the services of a concierge desk and the same food and drink as the Royal Palm Club but in a less grand setting on the 1st floor of the building’s atrium. Don’t look for a lagoon view room in this building—you’ll find only garden, marina, or pool views. Of course, the prices are lower than those in the Royal Palm Club. 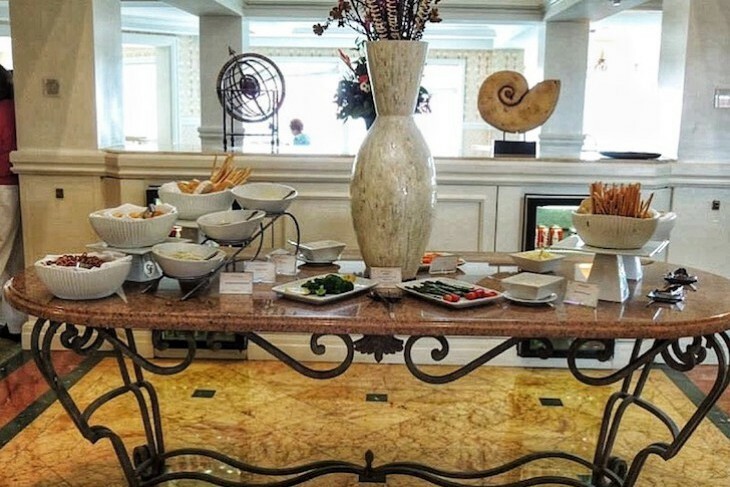 At both lounges you’ll find a continental breakfast of juice, fruit, yogurt, cereal, toast, bagels with salmon cream cheese, muffins, coffeecake, pastries, cinnamon rolls, croissants, hot oatmeal, cheese, and sandwich meats. Midday offerings are pretzels, chips, crudités with dip, hummus, cookies, lemonade, and iced tea. Late afternoon brings scones with Devonshire cream and marmalade, jam tarts, fruit, banana bread, coffee, and tea. Early evening features tasty hors d’oeuvres such as spanakopita, smoked pork loin with apple chutney, rosemary roasted vegetables, potato crepes with smoked salmon, duck pot stickers, beef and blue cheese bites, beef bruschetta with horseradish cream, Asian chicken with vermicelli noodles, spring rolls with sweet chili sauce, lamb meatballs, grilled vegetables, chicken fresh spring roll, chicken Wellington (yum! ), Italian stuffed bread, sweet glazed salmon, sushi, crudités with dip and hummus, and cheese and crackers. Wines include Mirassou Pinot Noir, Beringer White Zinfandel, Penfolds Rawson’s Retreat Merlot, Columbia Crest Chardonnay, and Mumm Napa Valley sparkling wine with a nice assortment of beer. Kids look forward to their own spread of turkey and cheese or PB&J sandwiches, mini corn dogs, cookies, and cupcakes with the occasional adult sneaking an irresistible taste of their own. A small spread of after-dinner desserts like mini-éclairs and cream puffs, fruit tarts, cheesecake tartlets, chocolate covered strawberries, cookies, cupcakes, brownies, and Rice Krispies treats are served with a selection of liqueurs. And everyone enjoys the self-service cappuccino machine and the refrigerator filled with beer and sodas. 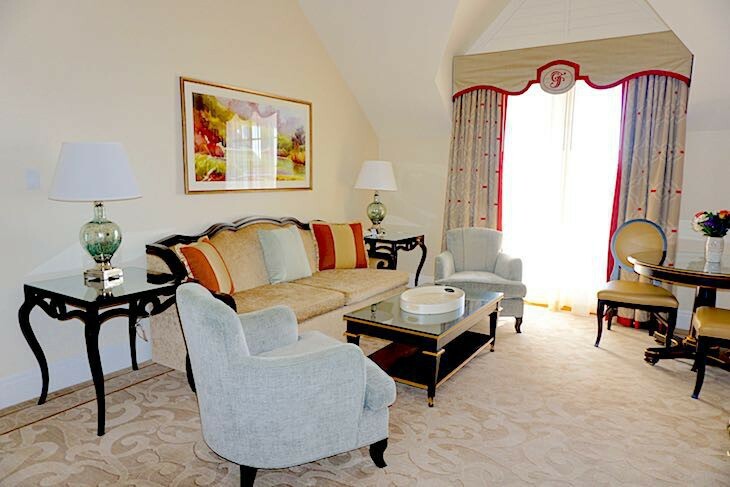 Grand Floridian’s suites can be had in all shapes and sizes. 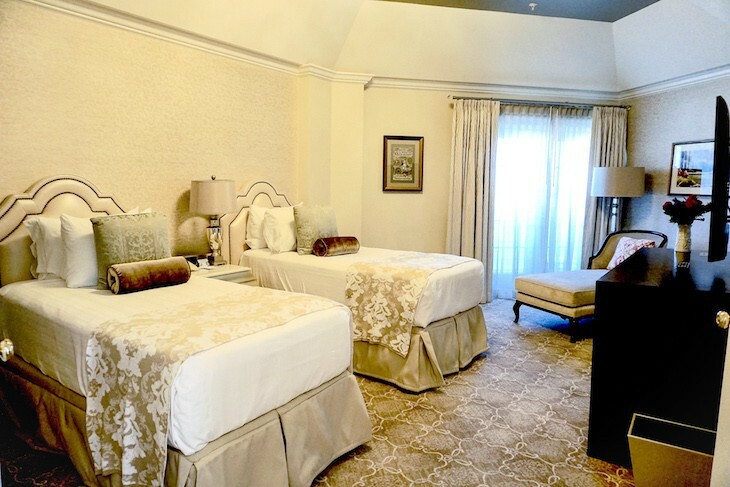 All come with more room than a standard guest room and a full living area or parlor as well as upgraded robes, DVD players, and fresh flowers. 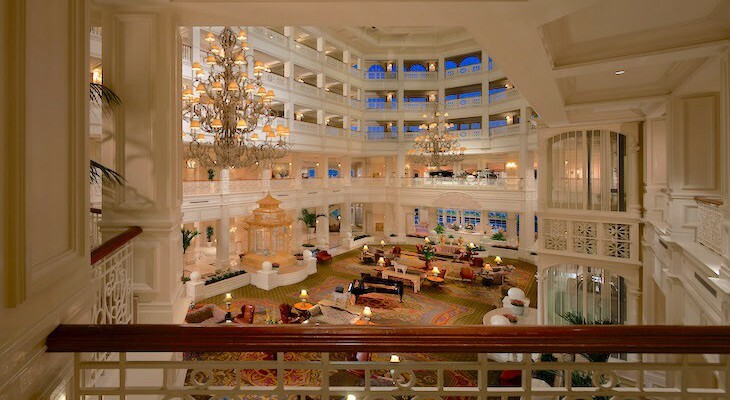 In the Main Building are four Signature Suites: the Grand Suite, Walt Disney Suite, Roy O. Disney Suite, and Victorian Suite. All Main Building suites, except for the Walt and Roy Disney Suites are located on the 5th floor. Grand Suite. 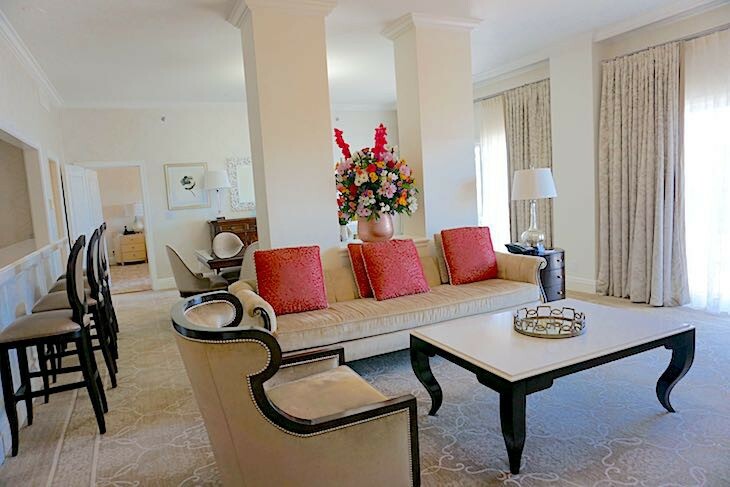 From its fifth-floor perch, the Grand Suite offers 2,220 square feet of luxury. 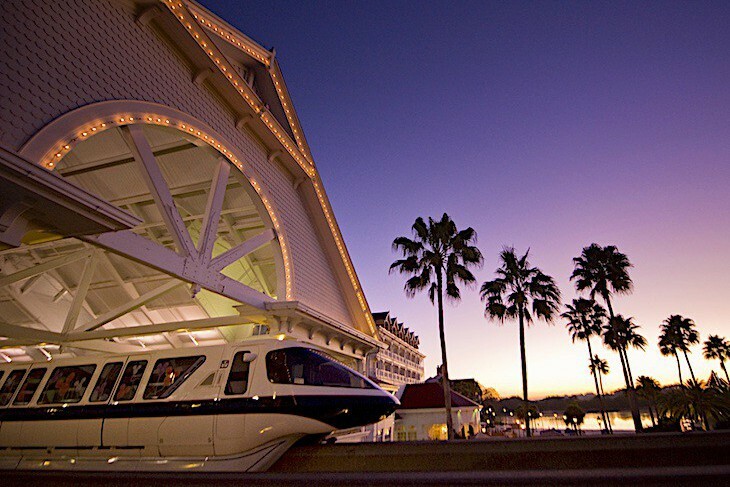 It features five dormer-style balconies with sweeping views of the Seven Seas Lagoon, Cinderella Castle, Space Mountain, Disney’s Contemporary Resort, Disney’s Polynesian Village Resort, even Spaceship Earth in the distance. A long entry hall with marble half bath leads to the sunny, turreted living room with dark hardwood flooring and crystal chandelier lighting. Furnishings are outfitted in shimmery cream/gold tones except for splashes of color in the persimmon-hued throw pillows on the two chenille sofas. 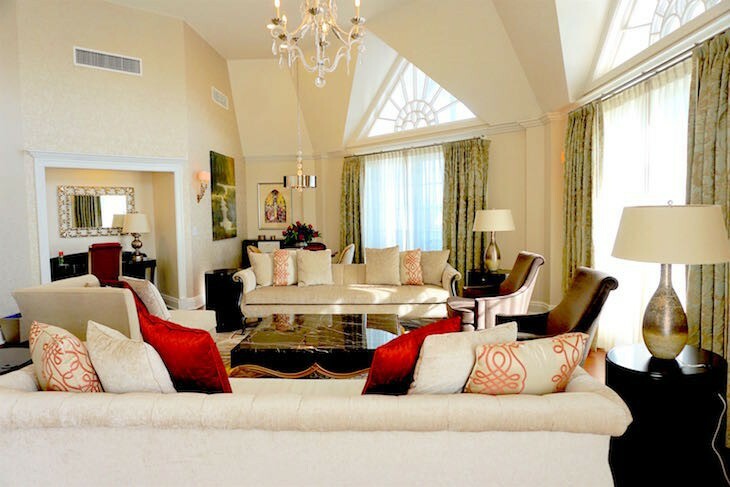 Centering the room is a large area rug and oversized black marble and gold coffee table. Off to either side of the sofas are two taupe easy chairs and a comfy chaise lounge. The room’s dining table seats four and nearby is a small desk in an alcove. 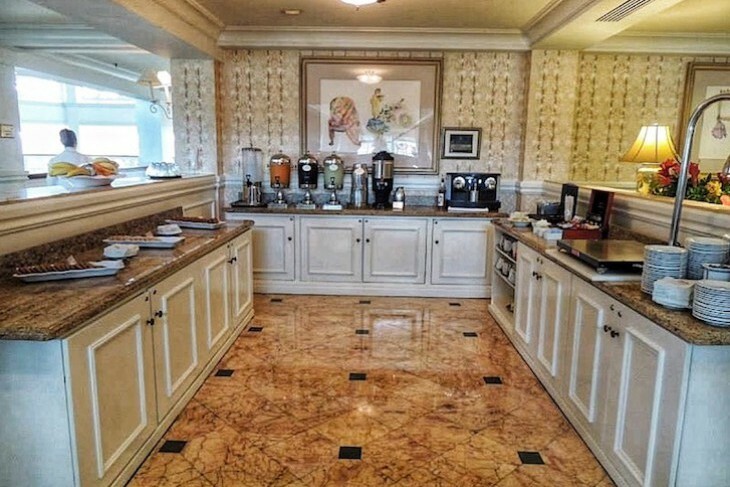 A marble wet bar features an under-counter refrigerator, coffeemaker, and microwave. Where’s the TV you ask? Hidden cleverly behind a framed wall painting that rolls up with a bit of Disney magic to reveal an oversized screen. 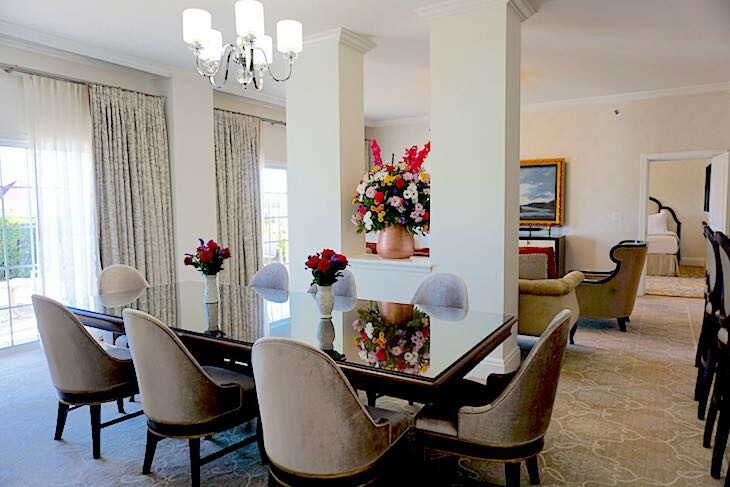 And there’s always a lovely floral arrangement to enjoy in all the Signature Suites. Off one side of the large foyer is the master bedroom. A king bed with bronze leather headboard is angled to face the bureau above which sits an oversized TV. 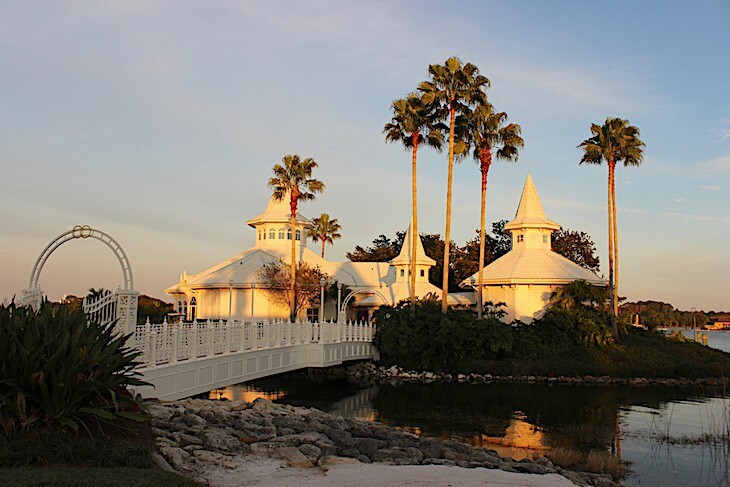 Also to be found is a mirrored vanity desk, easy chair, and, balcony views of Disney’s Polynesian Resort and The Villas at Disney’s Grand Floridian Resort, the wedding chapel, and the Beach Pool. 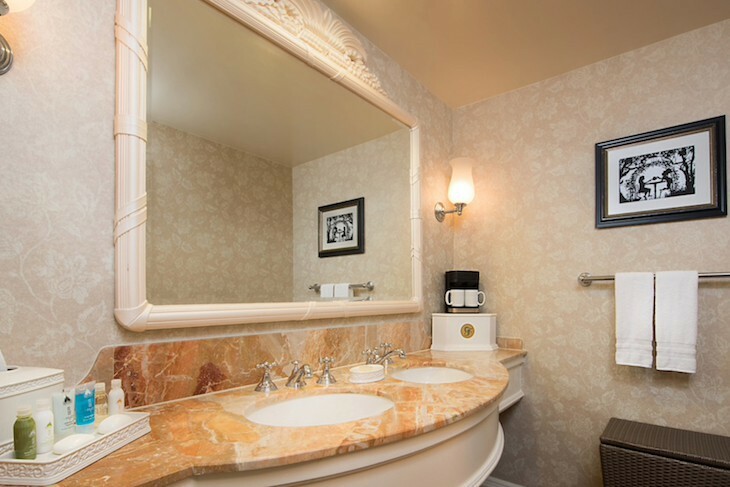 The solid cream-colored marble master bathroom has double sinks, soft golden wallpaper, two closets, large alcove whirlpool tub, huge shower, and a separate toilet and bidet. 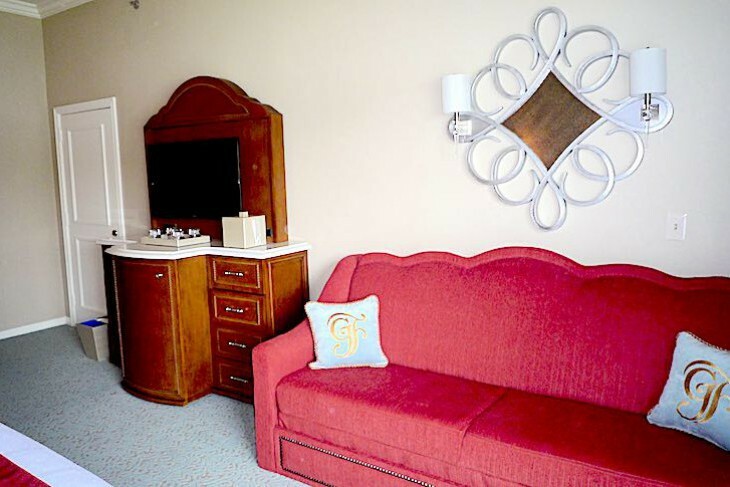 On the other side of the entry foyer is a second bedroom with two twin beds, chaise, bureau and oversized TV, a single-sink bath, and a balcony with the suite’s best view of Cinderella Castle. 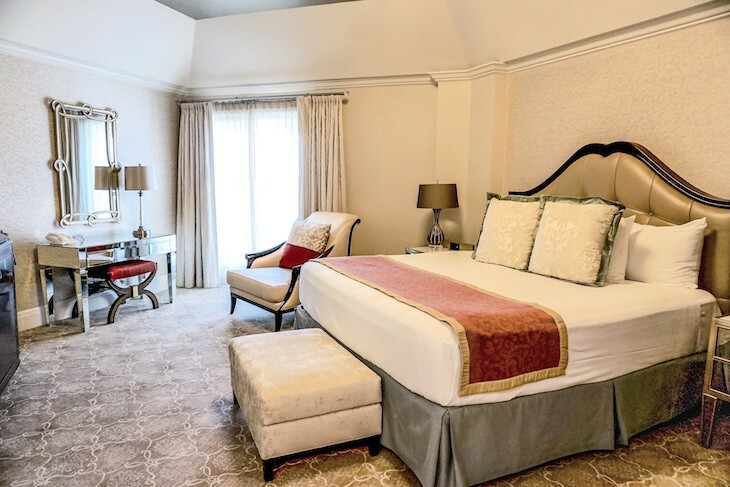 Both bedrooms have bronzed ceilings and shimmery neutral tones, and throughout the suite are lovely crystal chandeliers and fixtures. 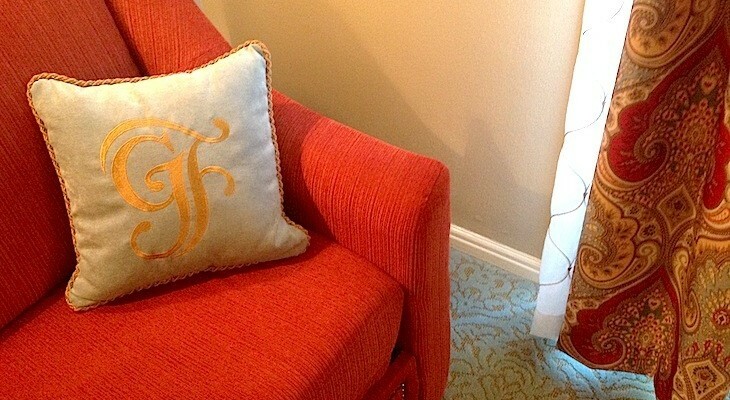 Walt Disney Suite. The 1,690-square-foot Walt Disney Suite is a favorite, filled with Walt’s memorabilia including railroad models and family pictures. You can almost feel you’re in Walt’s apartment, expecting him to return any minute. The overall look is of beige and shimmery accents in green and blues. Enter from the marble foyer into the cozy living room with wet bar, desk, sofa, two easy chairs, coffee table, and six-person dining table. 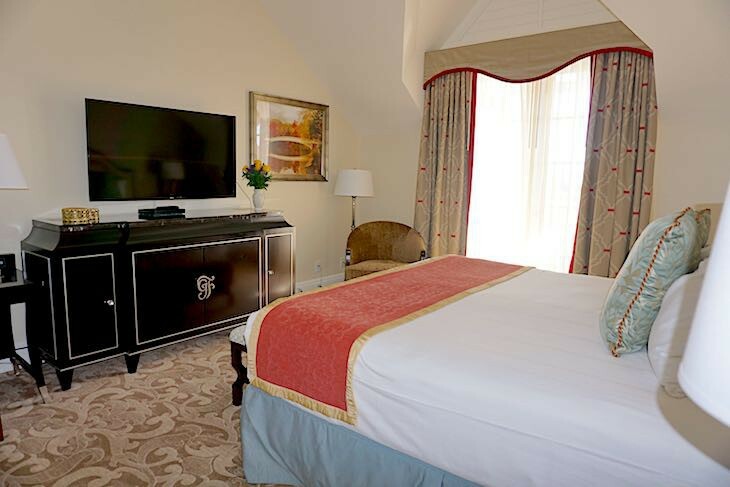 Like the Grand Suite, the TV is hidden cleverly behind a framed wall painting that rolls up with a bit of Disney magic to reveal an oversized screen. Off the foyer is a half bath. The master bedroom has a king-size bed, desk, two easy chairs, bureau and TV, a large walk-in closet with a small bureau, and a marble bathroom with two sinks, whirlpool tub, and separate, oversized shower. 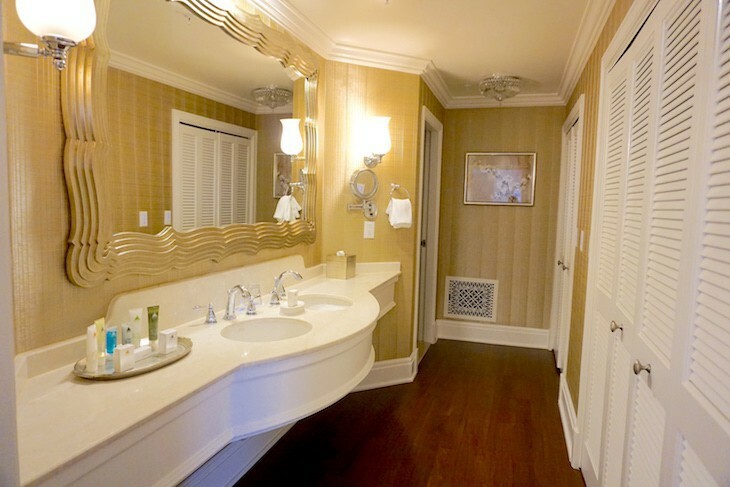 The second bedroom has a neutral beige/gold decor with twin beds, easy chair, bureau, TV, and second double-sink bath. A balcony that is almost the length of the suite faces the courtyard pool, the beach, and the lagoon with views of Disney’s Polynesian Resort and The Villas at Disney’s Grand Floridian Resort. Roy O. Disney Suite. 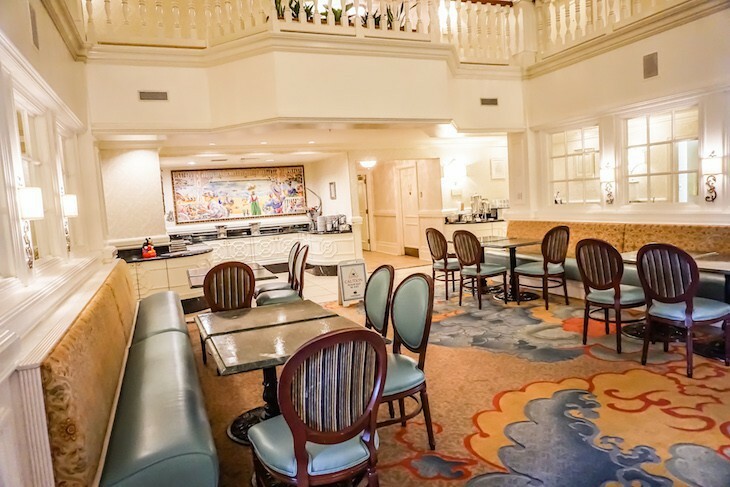 Just below the Walt Disney Suite is the Roy O. Disney Suite, comparable in shape and size with memorabilia representing Walt’s brother Roy, including a wall of family photographs. Victorian Suite. The intimate Victorian Suite at 1,083 square feet on the top floor of the main building offers a separate living area with wet bar with refrigerator, four-person dining table, and even an old Victrola. Overlooking the courtyard pool are three balconies with views of the top of Cinderella Castle and Space Mountain, Disney’s Polynesian Resort, and the Seven Seas Lagoon. Through French doors is the bedroom with a king bed, and the master bath has a large walk-in closet with dressing area, double-sinks, and oversize tub. Off the small foyer is a half bath. You’ll also find One- and Two-bedroom Suites, all with a variety of views including marina, lagoon, theme park, and garden. Located in both the main building as well as all outlying lodge buildings, they all come with access to the concierge lounge and services regardless of location. Cara's Tip: If you’re staying in a suite outside the main building you may choose to use either concierge lounge for convenience. All suites in the Main Building except for the Disney Suites are found on the 5th floor so with dormer balconies which automatically makes them smaller than their counterparts in the Outer Buildings. 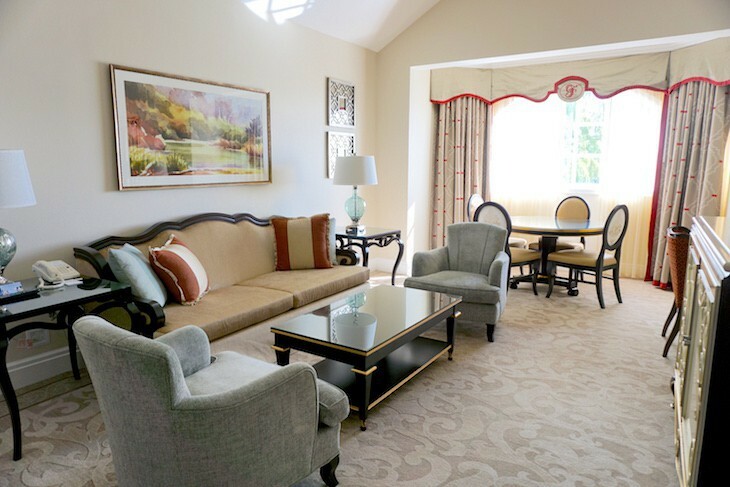 Two-bedroom Main Building Suites found throughout the resort are basically two standard-size guest rooms (one with a king and the other two queens), a living room with sleeper sofa, two occasional chairs, coffee table, desk, four-person dining table, and three balconies. All sleep eight with an additional half-bath off the living area. Two-bedroom Outer Lodge Suites found throughout the resort are basically two standard-size guest rooms (one with a king and the other two queens; or even each bedroom with a king bed), a living room with sleeper sofa, two occasional chairs, coffee table, desk, and four-person dining table. All sleep eight with an additional full bath off the living area. You can request a lagoon view, but be forewarned that these are smaller than those with a garden view. 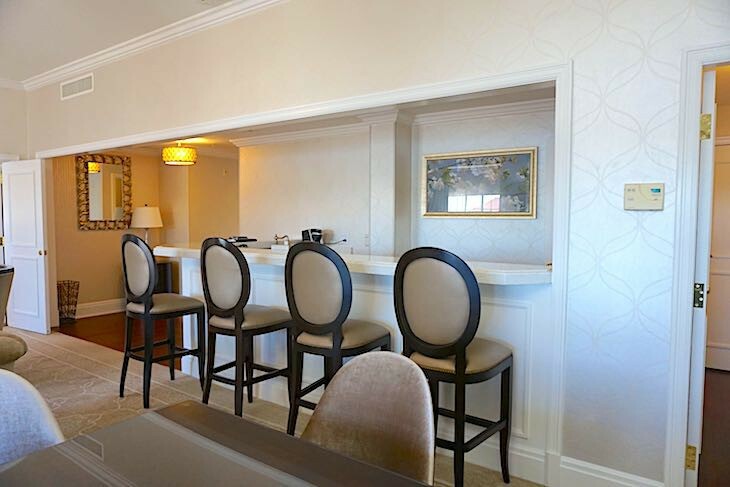 Two of these suites have a Magic Kingdom view in Sago Cay and Conch Key, but are a weird configuration—because they are corner suites you must go through a bedroom to access the rest of the suite. Some have a balcony off the living room (those in Sago Cay and Conch Key) but never on the top floor; those the don't have an alcove instead. Sleeps 6-8 people. A One-bedroom Outer Lodge Suite sleeping six comes with two queen beds in the standard bedroom and two full baths. In the smallish living area you’ll find a sleeper sofa, entertainment center, two easy chairs, and a 4-person dining table. Those on the top floors come with only an easy chair in the bedroom instead of a daybed and have a dormer balcony only off the bedroom. 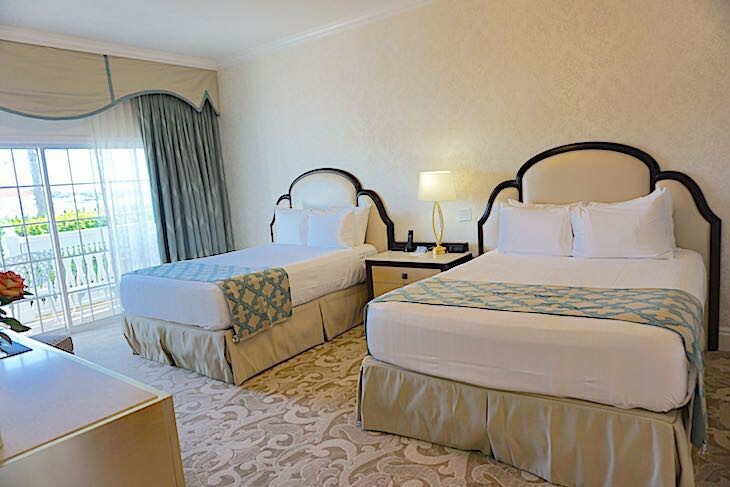 Two-bedroom Theme Park View Hospitality Suites each with 1,792 square feet offer the distinction of a straight on view of the lagoon and Cinderella Castle. Only two of these suites exist: the Everglades Suite in Conch Key and the Cape Coral Suite in Sago Cay, both located on the ground floor with a waterfront oversized patio made semi-private with surrounding shrubbery. For more privacy and quiet request the Cape Coral Suite (the Everglades Suite is near Narcoossee's and the boat launch). The double-size living area is great for entertaining with a large sofa, two easy chairs, marble coffee table, and, here too is a cleverly hidden TV behind a framed wall painting that rolls up with a bit of Disney magic to reveal an oversized screen. The full-size dining table seats eight. A large wet bar seating four with coffeemaker, microwave, undercounter refrigerator, and sink, and in a nearby closet is an additional refrigerator. A standard-size bedroom is found (one with a king, easy chair with ottoman, and desk; the other has two queen beds) on either side of the living area, both with patios. Sleeps 6.